TIPS® Toe Nail Conditioner is a more concentrated version of our TIPS® Nail Conditioner specially formulated to transform your cracked, dry, peeling nails into strong, beautiful nails. TIPS® Toe Nail Conditioner provides the nail and cuticle with beneficial natural ingredients, inhibiting the absorption of damaging substances that bombard the nail structure daily. How do I apply TIPS Toenail Conditioner? Apply the TIPS treatment when your nails are driest, which for most of us is first thing in the morning. Be sure to apply TIPS before exposing your feet to water, as it is designed to treat and protect your nails and cuticles from the damage caused by water and other harsh substances throughout the entire day. Take that first 60 seconds of the day for your nails. Apply TIPS daily to your cuticles, the entire top surface of your nails, the underside of your nails and the skin around your nails all the way up to your first knuckle. It is important to treat the area around the root of your nail, which is located just before your first knuckle. Once you are done applying the solution to all of your nails, wipe the excess into your feet just like skin cream. How is TIPS Toe Nail Conditioner different from TIPS Nail Conditioner? There are some specific challenges related to proper care of toenails. Generally, toenails are much thicker than fingernails and the skin around the cuticle is much tougher. The tremendous amount of moisture in shoes and socks exacerbates many of the problems we see with fingernails. To address these problems, TIPS for Toes is supercharged with 33% more of our exclusive ingredient. We've also added additional Vitamin E, an oil-soluble antioxidant to reduce oxidization of the lipids that the skin and cuticles need to be properly moisturized. Vitamin E is also a natural emollient, which will moisturize and condition. Can TIPS Toe Nail Conditioner be used on your finger nails? Yes, of course. In fact we recommend using TIPS Toe Nail Conditioner, as it is 33 % stronger, for people whose hands are more exposed to water and/or chemical substances, for instance: parents of young children, hairdressers, veterinarians, hospital staff, kitchen staff, just to name a few. We also recommend TIPS Toe Nail Conditioner if you are on medication that dries out your nails or increases your nails natural moisture such as thyroid medications. 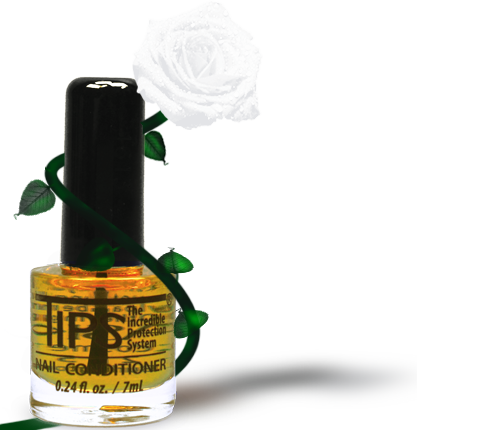 TIPS Toe Nail Conditioner is also great for people who want to grow out their artificial nails. In this case, simply apply the solution daily around the cuticles, on the skin around the nail, on any natural nail not covered by the acrylics as well as the underside of the natural nail. Results vary with different users, but generally speaking, with everyday use as directed, results for toenials will be seen within 2-3 months. However it takes the toenail 8-18 months to fully replace itself. The key to success is to stick with the program and to call us on our toll-free line if you have questions or need assistance in using our product. What are the “other ingredients” listed on the bottle of TIPS products? 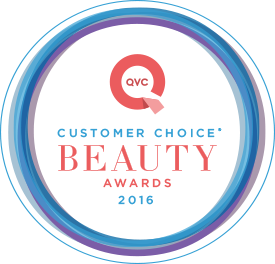 This term “other ingredients” refers to the exclusive ingredient we add to our formulation, which allows for the penetration of the lipids directly into the nails and cuticles, proven in independent studies by The California Skin Research Institute. 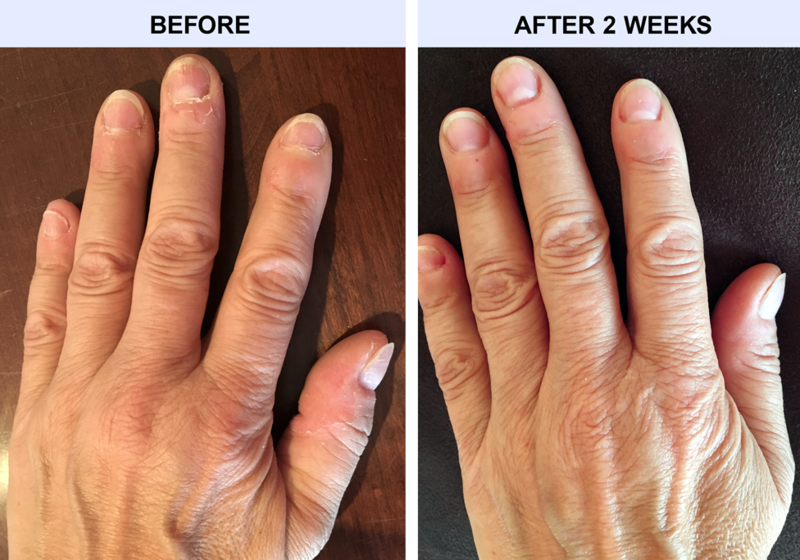 We sometimes call it our secret ingredient, as no one else on the market today uses it in their nail care products, and it is what makes our product unique and effective at treating, fortifying and strengthening the nails.